HAS YOUR DOCTOR EVER GIVEN YOU AN Rx for exercise? June Chapman got one last summer, a first for the 87-year-old retiree in San Marcos, Calif. "You sit on a chair, arms at your side," she says of the exercise her internist prescribed, "then rise up and sit back down on it. Every day. Repeat as often as you can." Chapman's doctor was a little ahead of the curve in recommending this kind of chairobic activity. Starting Jan. 1, all 46.6 million Medicare beneficiaries become eligible for wellness visits. 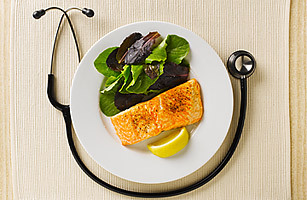 Unlike a physical, in which a doctor is mainly looking for big-time problems - and may spend only a minute or two scolding you for not eating right or exercising more - a wellness visit is designed to promote health and include lessons in how to make better lifestyle choices so you can avoid or reduce the effects of conditions like hypertension, diabetes and heart disease. Medicare recipients will be able to get this kind of coaching free once a year. And if the health care reform law kicks in as scheduled, many private health plans will be required - or, in some cases, given incentives - to offer expanded wellness benefits by 2014. "For the first time, doctors will be reimbursed by Medicare for talking to patients on an ongoing basis about healthy behaviors," says Dr. Edward Phillips, director of the Institute of Lifestyle Medicine (ILM), an education and advocacy group co-founded in 2007 by Harvard Medical School and Boston's Spaulding Rehabilitation Hospital. The only downside: the current crop of physicians isn't nearly as good at improving patients' routines as it is at treating sickness. "The average doctor is hamstrung by lack of time, training and interest," says Dr. Alex Lickerman, former director of primary care at the University of Chicago. "How many sit down with patients and talk about the barriers to losing weight? Most doctors are riot there [yet)." The new wellness benefit tasks doctors with creating "personalized prevention plans," which ideally will be tailored to each patient's daily routine, psyche and family life. And if that sounds more like a nanny-state mandate than medicine, consider that some 75% of the $2.47 trillion in annual U.S. health care costs stems from chronic diseases, many of which can be prevented or delayed by lifestyle choices. There's no question Americans need to stop smoking, eat less junk food and get more exercise. But can physicians - many of whom have little training in nutrition or exercise coaching - succeed in altering behaviors? "We are working our buns off trying to get these people to change their lifestyle," says Dr. Ann Sheffels, a family physician in a Minneapolis suburb. "But the public hasn't bought into it yet." Literally. Private insurers and corporate wellness initiatives have even resorted, with limited success, to offering cash, gifts and reductions in insurance premiums in an effort to motivate people to change their ways. Some firms, in trying to bring down health care costs, have hired health coaches to reach out to the sedentary or overweight to get them moving more. Others use interactive voice-response systems to keep tabs on participants' progress. In a study, Aetna set out to see whether it could reduce hypertension - and the attendant risks of stroke, heart attack and kidney failure - among its Medicare Advantage members. More than 1,100 participants were given automated blood-pressure cuffs and told to call in with readings at least monthly. They also got quarterly reminders to dial in. When they did so, an automated system run by Silverlink Communications provided immediate feedback, explaining what the readings meant and where to call for further advice. Alerts were also sent to nurse managers when readings were dangerously high. The result: of the 217 people who started out with uncontrolled hypertension and stuck with the program for a year or so, nearly 57% got their blood pressure under control. This kind of prodding is too labor intensive for physicians to take on alone. And if they're going to lead a team of dietitians, exercise physiotherapists and other health professionals, many doctors will need more training. That's where the nascent field of lifestyle medicine comes in. For example, in 2009, Chapman's internist, Dr. Brian Meyerhoff, took an ILM course called Active Doctors, Active Patients: the Science and Experience of Exercise, which not only teaches physicians to be better role models by increasing their own fitness level but also helps them prescribe exercise regimens tailored to a patient's age and health. Nutrition is on the medical menu too: Harvard's upcoming continuing education course Healthy Kitchens, Healthy Lives: Caring for Our Patients and Ourselves sold out five months in advance. The key to getting doctors to bone up on these kinds of topics is reimbursement, says Dr. Dean Ornish, the California based physician who has spent three decades showing how altering patients' habits can reverse heart disease. "Doctors don't learn this in medical school because they're not paid for it," he says. But that is beginning to change. In August, Medicare doubled coverage of Ornish's cardiac rehab programs, to 72 one-hour sessions with a hospital-based team whose specialties include exercise, yoga and psychology. The catch is that all the sessions have to be completed within 18 weeks. Intensive lifestyle interventions are not easy, but they can have big payoffs. In 1985, when San Francisco restaurateur Mel Lefer had a massive heart attack at age 53, he could barely walk a block and was not expected to live out the year. After enrolling in one of Ornish's team-based programs, he started doing yoga and eating a low-fat, vegetarian diet. He lost weight and strengthened his heart along the way. Now 78, Lefer says, "I can toss my grandchildren in the air. I have a wonderful life." But it took a lot of coaching - and lifestyle changes - to get him there. This is a tremendously positive trend that we enthusiastically endorse. But if you aren't yet old enough (for Medicare), and/or your doctor isn't able to give you good lifestyle and diet advice, then you are still on your own. Our advice to everyone is to 'take charge' of your own health, and - as the cornerstone of that strategy - take Juice Plus+ to bridge the gap between what you do eat (in fruit and vegetables) and what you know you should eat (9-13 servings every day). That's our 'bridge', what's yours?